In RIKEN Nishina Center for Accelerator-Based Science, the analysis program is called AnaPAW, which is Ana + PAW. PAW is an old analysis program developed by CERN, and no longer supported. It is going to be replaced by ROOT. PAW is based on Fortran 77. Ana is a package for reading the speciallized data format (.ridf) in RIKEN. analyzer : a program for analyzing the raw data. some analyzers will be shared by difference detectors of same type. i.e. if there are many plastic scintillators, they may use a same program for processing the raw data. ID : this usually referring which “detectors” you want to get in an analyzer. W# : what kind of data you want. call a data file ready to read. But NOT read yet. using an “ana code” file (.ana), calling “analyzers” ( analyzing program ), and specific which data will be plotted. the AnaPaw will read the data file according to the ana code file specification. select which histogram to plot. one difficulty of using anapaw is that, the relationship of analyzers are hidden in the code. Some analyzers are independent, but most of them are dependent. This dependence is due to the calling of other analyzer value (common value). in order to get the common value, other analyzer must be run in advance. thus, to use an analyzer, we have to check the enc*.f file to see which analyzer is needed. another difficulty is that, to know how to use the analyzer, we have to read the code file and most of them have comment on the top. i always suggest they use include the analyzer dependency in the comment. However, since the dependency can be multiple levels. i.e. A depends on B, B depends on C, and so on. thus, that make anapaw is very scary for beginner. long time ago, the post on parity is quit a mess and confusing. now, i have a better understanding and try to do it once again. what will happen if parity is hold or violated. Parity is a transform that reverse the space dimension. it sound simple. the tricky part is, there are 2 kinds of transform: active or passive. in short, active transform is change of vector. while pass is change of coordinate. To avoid confusion and make me and reader thinking to be the same, i use active transform in here. in 1-D space, the parity is just reverse of the direction. in 2-D space, parity is equal a rotation of 180 degree on the plane, thus, it is not really a parity but as a special case for rotation. in 3-D space, parity is just like changing our left-hand to right hand and vice versa. many people will say that, it is same as MIRROR transform, which is a plan inverse. But it is not true. 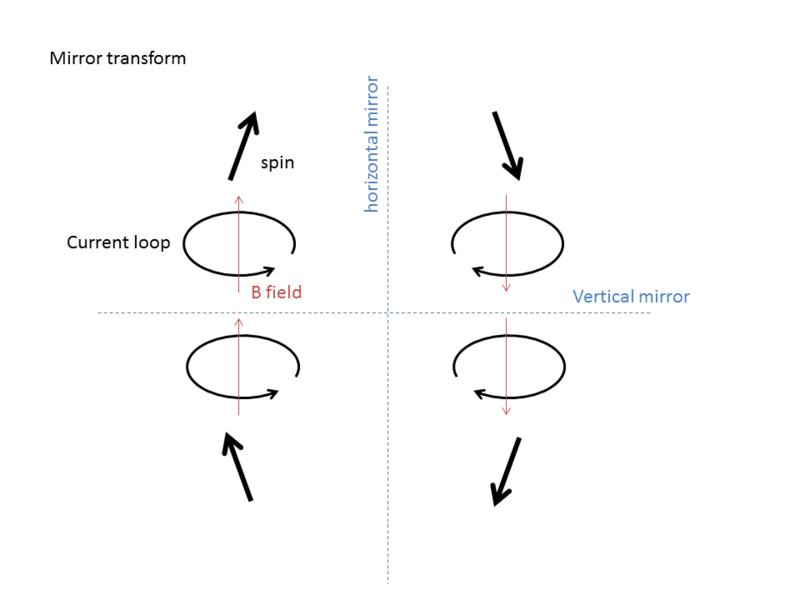 the correct description is a mirror transform + 180 rotation around the normal of the mirror plan. Thus, if we only concern about the shape instead of orientation, a mirror transform is ok. Nevertheless, when we talking current loop, the direction is important that, the magnet is a mirrored inside the mirror. and we knew that all magnetic field is either by current loop or spin. in 4-D, well, i don’t know. To answer the 2nd question, we have to know what is parity conservation. the parity conservation is that, thing keep the same under parity transform. i.e. the plus sign means EVEN parity, and minus sign means ODD parity. people knowing some maths will know that, it is corresponding to even function and odd function. Thus, a parity conservation mean that, all physics are same under parity. The other thing to say so, is, the mirrored world is same after we rotated it back. A famous example of parity violation in nature is the experiment on Cobalt-60 nuclei, which will undergoes beta decay. *** at the beginning, i was very confused. one major confusion is that, the active transform or passive transform and the mirror world. i found that, inside the mirror, we should NOT use “left-hand rule” instead of “right-hand rule”. if we do a mirror transform, and use “left-hand rule” , the transform will be cancelled. because, changing the “handiness” is same as passive transform. another difficulty is that, a mirror transform is not parity transform, but most popular science mixed them up. 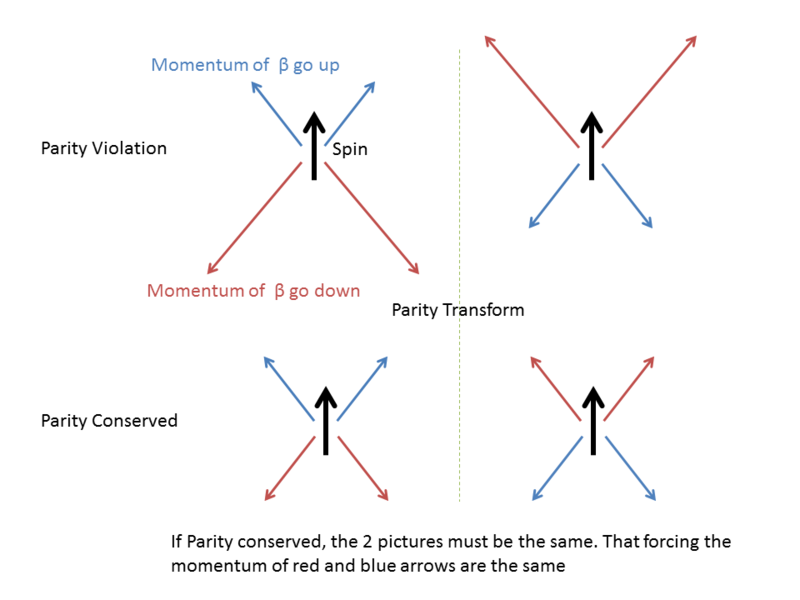 a Major difference between mirror and parity is: there are 3 difference reflection plans, but parity is a “point inversion”. when you select difference plan of reflection, your current loop will keep the same or change direction, that make it sometimes keep orientation, but sometimes not. that difficulty raised because lack of understanding the proper transform of pesudo vector under mirror transform. we the help of the picture, we can now easily imagine parity as mirror. I had a little chat with SASAMOTO San on her pervious research on carbon-12. In ground state, carbon-12 is a stable nucleus with 6 protons and 6 neutrons. In one of the excited state, it will use alpha decay to release energy. According to alpha decay theory, an alpha particle should be formed before the decay and oscillates or hit the column potential barrier million and million of time to get tunneling through. And theory calculation on the wavefunction show that the excited carbon-12 will form 3 alpha particles. since the 6 protons has 15 way to combine in group of 2, thus, there are 225 ways to form 3 alpha particles. And only 1 of them will finally get out. Will these multiplicity increase the chance for tunneling and reduced the lifetime? SASAMOTO San studied the excited state. And she knew somebody studied the alpha decay. Thus, by compare the decay rate with other nuclei, may be we can find out the role of multiplicity in decay. The ground state of alpha particle is spin zero. And a spin 1 state of it is about 20MeV. However, adding one more proton will greatly reduced the energy. What is going on in alpha particle? the DC B-field voltage is 3.100V. i found that i have have to tune the voltage slowly, to let the CRO signal stabilized. The NMR setting is 12.8MHz, Level 200, pule length is 5uS on +Y axis. FWD is 49W, BWD is 7W. Gain is 35db, LPF is 100kHz and polarization is 90 degree. the FID signal is about 200mV peak to peak. Let me briefly explain the NMR circuit, for reader who want to know the theory. HERE. Black arrows are any cable, Orange arrows are 12.8MHz cables. 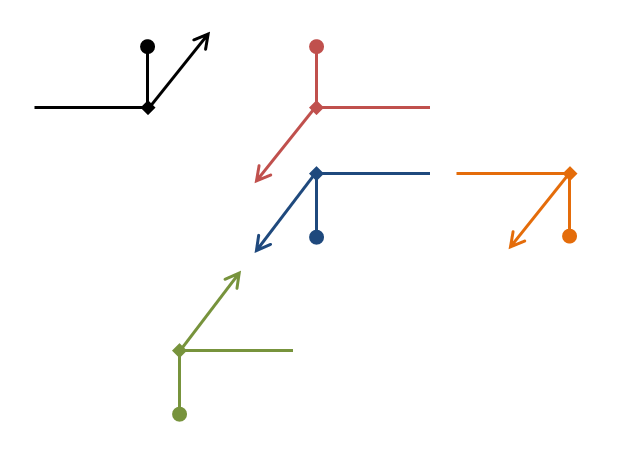 The direction of the arrow shows the signal flow. the NMR pulse is a mixture of 2 signal. the RF generator provides the larmor frequency. and the pulse generator provides a square wave, the duration of the square determine the pulse time, it should be matched the requirement for π/2 pulse. and the period of the pulse should be longer than the T2, longitudinal relaxation time. since we don’t want to either distorted the RF or use 1 more RF generator, the splitter simply split the signal, 1 be a main signal and the other one be a reference signal. The purple mixer or Double Balanced Mixer (DBM). the function of it is multiple the 2 input signal together. the circuit inside, may be i study later. after the Mixer, the signal will be amplified and pass a λ/4 cable. i am not sure is it necessary to use a λ/4 cable in here. but anyway, we knew that the phase different from the Amplifier to the crossed-diode is λ/4. the crossed diode has a feature that only allow signal, which larger then 0.6 V to pass. when the pulse come in, it will not see the diode. however, when the in put signal are off, the signal from the NMR coil will be generated and this signal is smaller then 0.6V, thus, the crossed diode act as a switch or duplexer. the λ/4 cable from the crossed diode and the NMR tuner + Coil is for impedance matching. even there are little bit mismatch of the tuner, the λ/4 cable is still approximately equal to the impedance matching case. that smoothen the signal. and i don’t know is it necessary to use a λ/4 cable from the cross diode to the amplifier. after the amplifier increase the signal and mixed with the reference signal at the differential mixer. The Free induction decay (FID) signal should be at the Larmor frequency. However, if the input frequency is not exactly, with just little bit of mismatch, the spin can still be rotated. by different the NMR signal with the reference signal ( which is the signal we put in the NMR coil) we can tell the different and calculate back the true Larmor frequency by Fourier transform. and also, by different the NMR signal by the reference signal, we can more easy to tell the different then by just looking at the NMR signal. since the different usually just few kHz, compare with the Larmor frequency 12.8MHz, less then 1 % deferent. the different mixer also decompose the signal into sine and cosine waveform. this is because, by only look at the cosine wave, we cannot know the different of the signal is positive of negative. the cos wave is natural real part of the complex wave. 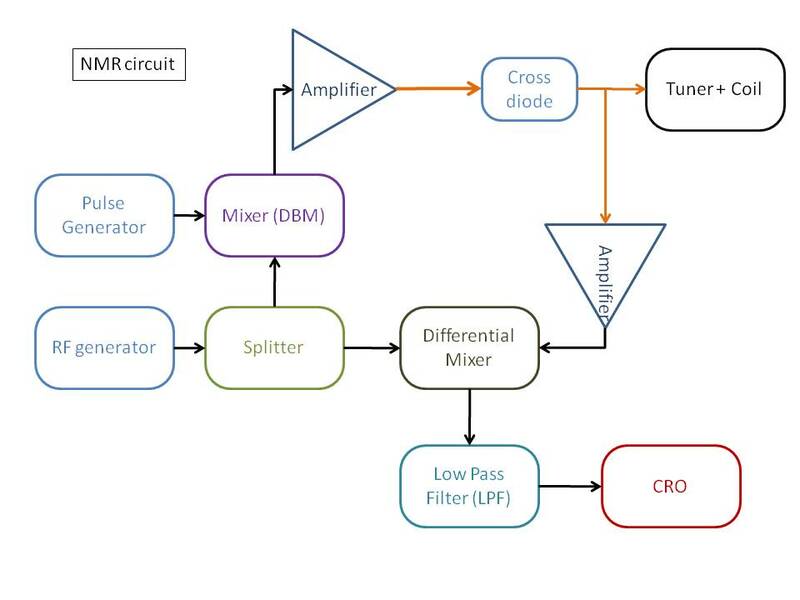 the low pass filter (LPF) can be set the maximum frequency pass. this is for seeing the decay envelop of the FID. anther function is reduce the high frequency noise.